Maddie began working for the 9-2-3 team a few months ago now, she’s a wonderful new addition to the company, has a keen eye for business development and is known to make a wicked batch of cupcakes…! Here’s a little bit more about Maddie! Flexible working is keeping me sane. My first job after getting my business administration degree from Cardiff University was on a graduate scheme at Abbott Laboratories. This involved 18 months in sales, and 18 months in a marketing role. I realised that sales was my bag and my career consisted of working my way up to Executive sales position. After having my first child I went back on 4 days, but still had to hit all the same targets as my colleagues. I was dropping my daughter with the childminder at 7am, picking her up at 6pm and then still working to 11pm when she went to bed. The logistics of going away on a 3 day sales conference (which happened every 3/4 months) was a nightmare, with no family living nearby we were paying through the nose for childcare. I felt I was failing as a mum and as an employee and was so miserable. I loved my job, but when my daughter took her first steps at the childminders, I decided I was missing out on so much. I also suffered a family tragedy which really puts life in perspective. All of these elements combined in me deciding to take a career break, and we leapt at the chance of moving to Florida with my husband’s job. I had no choice but to embrace the lifestyle of a stay at home mum, and now had a 6 month old and 2 year old. We had a fabulous 4 years in the States, and I loved being around for my family. We returned to the UK and both kids were in school. I wanted to get back into work - but literally couldn't find anything which meant that I could still be there for school drop off and pick up. Desperate to do anything I got a job at the Oxfordshire museum in the café, I loved being with customers again - but it wasn't really challenging me in anyway. Then a friend recommended 9-2-3, so I signed up and Helen got a me a fantastic job with a fantastic company where I was involved in lead generation and market research for technology companies. I could literally do the hours when I wanted. This grew my confidence considerably, and I soon realised those old selling skills had not vanished after watching too much Peppa Pig! It also gave me hope that there was more of a movement to find flexibility in the workplace. Unfortunately, the market research role ended, but Helen then contacted me to come and work for her. I am absolutely loving being involved with people, candidates and clients and helping people with something I feel so passionate about. It’s great seeing more businesses working to attract the best talent for their organisation by choosing to offer flexible working. I feel like I'm winning at life: being a good mum and achieving something for myself for a great movement. I certainly feel a lot saner in the workplace all thanks to 9-2-3. I’m a husband and father of two young children, aged 10 and 5. We live in Altrincham and I take the Metrolink to work in Manchester City Centre every day. I’m the Managing Director of Code Computerlove, we’re a digital agency with around 100 staff, based in the Northern Quarter. 2. Your fave spot in Manchester? 3. How would you describe your ideal working week? I love being in the office, but I know I’m more productive when I’m totally by myself. So my ideal working week has me working from home for a day or two, speeding through a backlog of work I’ve been meaning to get to for a while – it’s very satisfying! Tough question as there’s so many! I’d say The Stone Roses are my favourite Manchester band, but my favourite song by a Manchester band is ‘Hymn from a Village’ by James. 5. Why does flexible working appeal to you? I’m probably a workaholic, I love what I do and so work is intricately woven into my life. I’ve got a family and 2 young children so I do need to juggle my work and family lives so I need flexibility to be able to do that. Sally Hunter, Account Director at Equator, Manchester. Here’s Sally at Equator Design (who do some really great stuff by the way..), taking part in our #northernflex campaign. The team here LOVE a work/life balance and are really creative about implementing this. Take a read of Sally’s interview here on her fave spots in Manchester and why she loves working at Equator. 1. Tell us a little about you? Yorkshire born and raised, came to Manchester to study at University and never left. I am one of 3 sisters, 3 of us are triplets and from a very close knit family. I have a husband called Ian and the love of my life, my German Shepard, Foxy! My favourite spot in Manchester.... There’s so many amazing ones to choose from! I love Mexican so Luck, Pistol and Burn is a great place for good food and wine and also Mackie Major if there is a big group. Great place with multiple food vendors and great selection of drinks! My ideal working week would be a mixture of being in the office and at home, working closely with the team and being in front of the client. Client interaction is my favourite part as you get great satisfaction from this when a job is done well. 4. Fave Manchester band/ song? Oasis 100%, don’t look back in anger! As an agency we pride ourselves on a family environment and flexible working appeals to this culture. We have certain incentives of flexible working such as bringing your dog into work, weekly breakfasts and beer Fridays. All of which are a great way to say thank you for all the hard work they have put in! 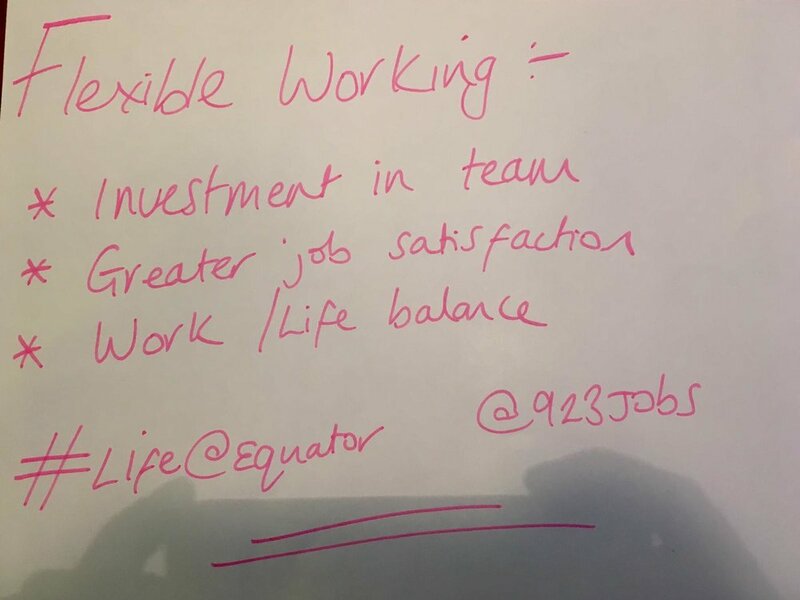 If you have any questions or would like to get in touch with us at 9-2-3, then do feel free to contact kat@923jobs.com who would love to have a chat with you!